BUNKERVILLE, Nev. (AP) — U.S. Interior Secretary Ryan Zinke toured two national monuments in Nevada on Sunday but canceled plans for meetings Monday in the Las Vegas area in order to head back to Washington, D.C., for what he said will be a Cabinet meeting involving President Donald Trump’s top appointees. Zinke met reporters outside a rancher’s home in Bunkerville, the hometown of jailed cattleman and anti-government icon Cliven Bundy about 80 miles northeast of Las Vegas. He didn’t meet with any Bundy family members. As the head of the department that includes the Bureau of Land Management, Zinke made it clear he believes in small-sizing national monuments. “They can’t be large tracts of public land or private land or state land,” he said. Zinke toured the Gold Butte and Basin and Range national monuments, which cover a combined 1,500 square miles – more than half the size of Delaware. But he didn’t say he’s made any decisions about whether to downsize the two monuments created last year by President Barack Obama before he left office. “What I’ve learned in this monument review is that every monument is unique,” Zinke said Sunday afternoon. The monument is home to pioneer-era and Native American artifacts, and rare and threatened wildlife, including the Mojave desert tortoise and desert bighorn sheep. A recent study by the Bureau of Land Management documented nearly 400 ancient rock art panels and more than 3,500 individual petroglyphs scattered throughout the Gold Butte area. Bundy argues that the federal government has no jurisdiction in such vast rangelands of the West. He and four of his sons are in jail awaiting federal trial on felony charges that they organized an armed insurrection to turn away Bureau of Land Management agents and contract cowboys and to release cattle collected from the Gold Butte range. Federal officials say the bureau was trying to enforce court orders issued for Bundy’s years-long failure to pay federal grazing fees. In an effort to urge Zinke not to change the monuments he toured, Sen. Catherine Cortez Masto, a Nevada Democrat, recently made a two-minute videotape, and Rep. Jacky Rosen, a Democrat running for Republican Sen. Dean Heller’s seat in 2018, sent a letter to the interior secretary. 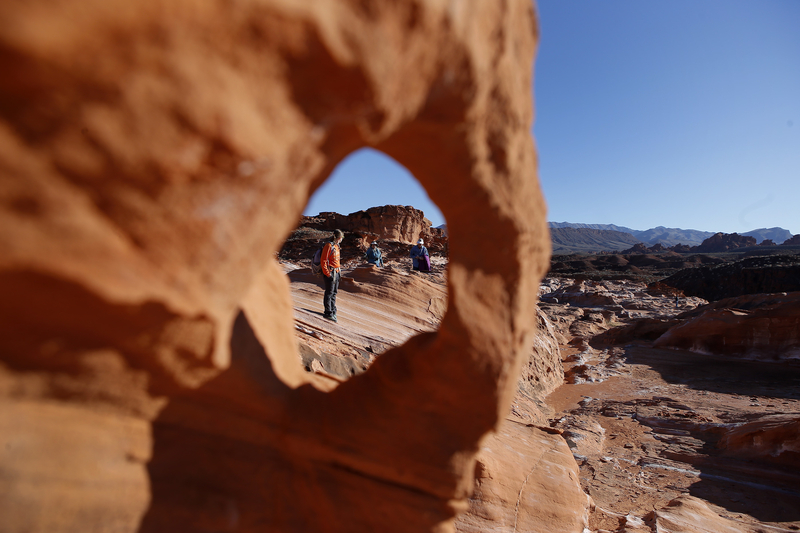 In addition to preserving cultural history, native wildlife and scenic beauty, Gold Butte and Basin and Range generate more than $150 million annually for Nevada’s economy, they said. “Apparently the 2.7 million public comments submitted in favor of keeping these monuments were not enough to help Mr. Zinke make up his mind,” Masto, a member of the Senate Energy and Natural Resources Committee overseeing the Interior Department, said about a public comment period that closed earlier this month. Outdoor retailer Patagonia took out two full-page ads in the state’s largest newspaper Sunday in support of the two Nevada national monuments. On Friday, Zinke took a helicopter tour of the Organ Mountains-Desert Peaks National Monument in New Mexico and held a roundtable event with ranchers, county commissioners and university professors. Last week, he removed Colorado’s Canyons of the Ancients National Monument from the list under review. He previously dropped two others, one in Idaho and one in Washington state. A full report is due next month. Written by KEN RITTER and SCOTT SONNER, Associated Press. Maybe I am the only person who views Zinke as taking an all expenses paid vacation while allegedly “on the job”. Perhaps, this is compensation for him missing out on the periodic boondoggles he enjoyed as a member of the House. Fortunately, there are enough interested organizations to litigate any stupid decisions coming out of Washington. I really like the fact that he’s actually coming out, visiting the areas, talking to locals, seeing with his own eyes what the situation actually is, and whether these national monuments actually need to be 1.8 million acres (!!!) or whether we can possibly, through the use of some crazy mapping technology (you know, like Google Earth), come up with a smaller boundary that still protects what needs protecting without squishing entire industries and towns. I suspect he’ll find it can be done with a scalpel rather than the sledgehammers obama and clinton used. Why don’t you vocalize or write your complaints to someone who would be interested in them, namely the Secretary of the Interior, Ryan Zinke. I count myself among those that tire of the recliner coaches and outhouse lawyers. You just count as an outhouse with a loud mouth. And if I look below the seat in the outhouse I will find you, you clever little imp, you. But Chrissy, I worked, too bad you can’t brag about your sordid life. What does the US Constitution say about the federal government owning land? It says very little. If you are alluding to the Enclave Clause, you are among the many kooks who misinterpret it. The Enclave Clause refers exclusively to the formation of the District of Columbia. Two centuries of Supreme Court decisions confirms this and supports the power of the federal government to own land.